Mount Hua, or Hua Shan (simplified Chinese: 华山; traditional Chinese: 華山; pinyin: Huà Shān), or Xiyue (Chinese: 西岳; pinyin: Xīyuè; literally: "western great mountain") is a mountain located near the city of Huayin in Shaanxi province, about 120 kilometres (75 mi) east of Xi'an. 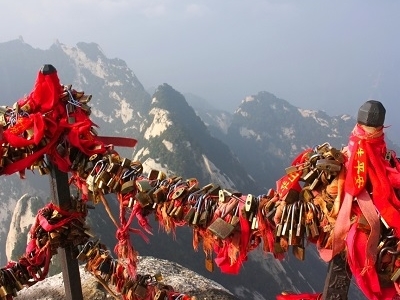 It is one of China's Five Great Mountains, and has a long history of religious significance. Originally classified as having three peaks, in modern times the mountain is classified as five main peaks, of which the highest is the South Peak at 2,154.9 metres (7,070 ft). Mount Hua is located near the southeast corner of the Ordos Loop section of the Yellow River basin, south of the Wei River valley, at the eastern end of the Qin Mountains, in southern Shaanxi province. It is part of the Qin Mountains, which divides not only northern and southern Shaanxi, but also China. 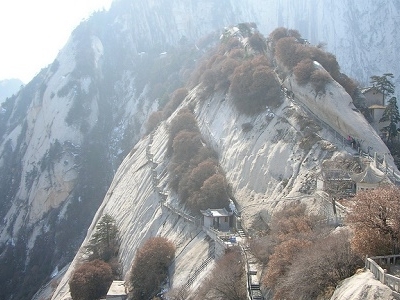 Huashan has a variety of temples and other religious structures on its slopes and peaks. At the foot of the mountains is the Cloister of the Jade Spring (玉泉院), which is dedicated to Chen Tuan. 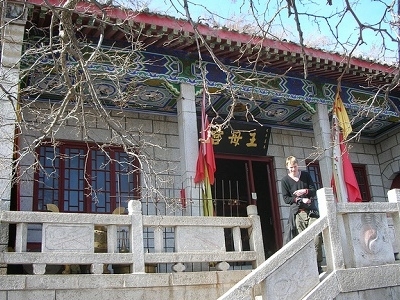 Additionally atop the southern-most peak there is an ancient taoist temple which in modern times has been converted into a tea house. Here's the our members favorite photos of "Peaks or Summits in Shaanxi". Upload your photo of Mount Hua!